I LOVE SOUP!! I mean, it’s the perfect food. You can take your favorite things and throw them in a pot and turn them into your favorite soup! 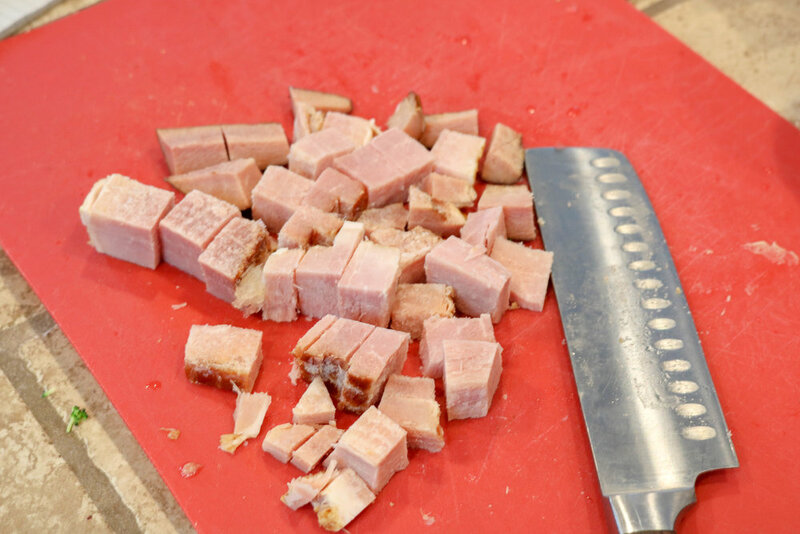 This recipe came from a need to use up the leftover holiday ham I had in my freezer. “Waste Not, Want Not” , right? It is so EASY and can be done in quite the jiffy! This soup, like all of my others can be modified for the Instant Pot as well. Just do it on the saute function! **It’s important to note that I always do the same things as on the stove top and at the end before adding any dairy to the soup recipe, I close it up, seal it and Pressure Cook it for about 5 minutes! 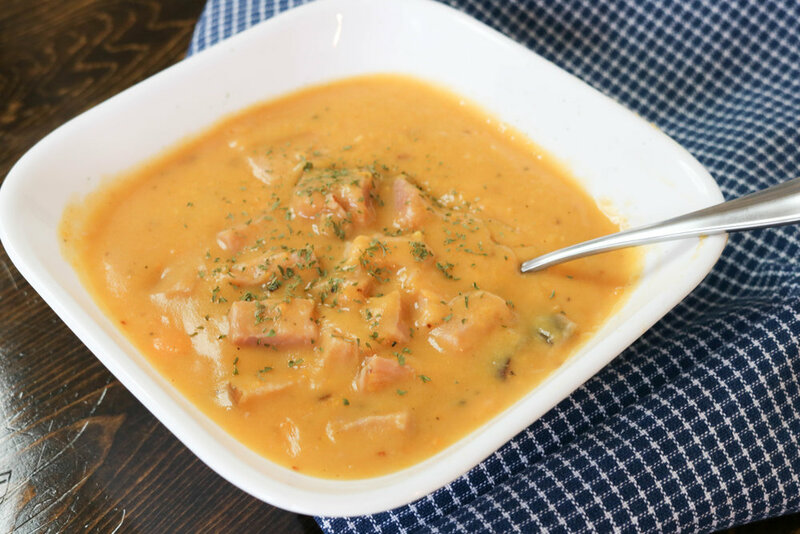 So, here is your sweet and savory, Sweet Potato and Ham Soup recipe! Melt the butter and bacon grease in a heavy soup pot. I love my Lodge Cast Iron Dutch Oven. It is a 6 quart and is plenty big. Once the fat has melted, add salt, pepper and red pepper flakes and stir. Sprinkle in flour to make a paste or slurry. Cook at medium to high for about 1 minute to remove the flour taste. Add in sweet potatoes and stir to coat with the roux mixture. Heat through and slowly add in vegetable broth. Whisk until it almost is as thick as you want it. Add in ham and heat through as it thickens. At the very end, right when it is almost as thick as you desire, add in the cheese and a splash of half and half. Lower heat to simmer until cheese is melted and serve! **If the soup ends up being thicker than you want, add a little water, about 1/4 of a cup at a time until it thins to your desired consistency. Sweet Potato and Ham Soup. A sweet and savory combination with a kick! Melt the butter and bacon grease in a heavy soup pot. I love my Lodge Cast Iron Dutch Oven. It is a 6 quart and is plenty big. Once the fat has melted, add salt, pepper and red pepper flakes and stir. Sprinkle in flour to make a paste or slurry. Cook at medium to high for about 1 minute to remove the flour taste.Add in sweet potatoes and stir to coat with the roux mixture. Heat through and slowly add in vegetable broth. Whisk until it almost is as thick as you want it. Add in ham and heat through as it thickens. At the very end, right when it is almost as thick as you desire, add in the cheese and a splash of half and half.Lower heat to simmer until cheese is melted and serve! **If the soup end up being thicker than you want, add a little water, about 1/4 of a cup at a time until it thins to your desired consistency.